This kind of DVI to VGA Converter converts digital DVI signal into analog VGA video signal. It allows users to enjoy a high definition image when watching movies or playing games on the traditional VGA monitors or projectors. It offers solutions for digital entertainment center, HDTV retail and show site, HDTV, STB, DVD and Projector factory, noise space and security concerns, data center control, information distribution, conference room presentation, school and corporate training environments. 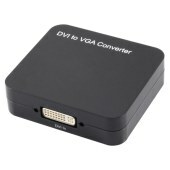 Conversion: It could convert complete DVI into VGA video output. Support 165MHz/1.65Gbps per channel (6.75Gbps all channel) bandwidth for DVI Input.